PREAMBLE: We give glory to God who has given us victory by strengthening us above all our enemies and have put a new song in our mouth. Arising from the last Holy Ghost Congress, we have started singing Songs of Victory. It is therefore not surprising that God gave our father in the Lord, The General Overseer; Pastor E.A. Adeboye “Stronger than Our Enemies” as the theme for the first Holy Ghost Service in the Year 2018. He reiterated in his prophecies for this year that “Many of us will triumph over our enemies” because it is a year of reward when many will “count down comprehensive victories”. May God help us to experience the harvest of these prophesies in full. May we have unprecedented victories in all spheres of life that will keep us singing with an overflowing joy in Jesus name. Amen. As we know that whatever is good require prayers, the following prayer points will be helpful as we wait upon the Lord in a declared 50 days of fasting and prayers starting from Thursday 11th January to Thursday 1st March, 2018. May you be mightily blessed, as we pray through in the mighty Name of Jesus. 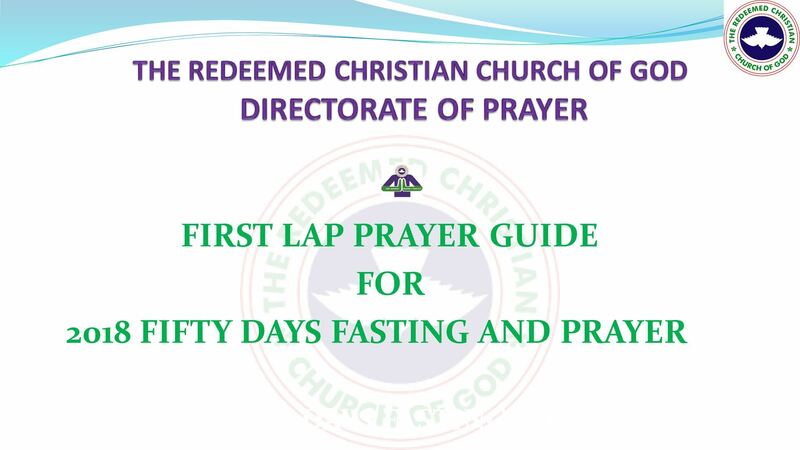  Let us praise Him for the manifestation of Signs and Wonders since the establishment of RCCG.  Psa 150:1 Praise ye the LORD. Praise God in his sanctuary: praise him in the firmament of his power.  Psa 150:2 Praise him for his mighty acts: praise him according to his excellent greatness.  Psa 150:3 Praise him with the sound of the trumpet: praise him with the psaltery and harp.  Psa 150:4 Praise him with the timbrel and dance: praise him with stringed instruments and organs.  Psa 150:5 Praise him upon the loud cymbals: praise him upon the high sounding cymbals.  Psa 150:6 Let everything that hath breath praise the LORD. Praise ye the LORD. Text: Matt. 18:22Jere. 31:34; LUKE 23:34, 1kings 13:1-6; Act 7:54-60, John 3:16. Your lack of forgiveness can sabotage your comprehensive victory. Since no one can offend you Seventy times Seven Times, therefore, learn to forgive so that your fasting and prayers can be acceptable before God. Your waiting on Him will never amount to an hunger strike. Amen.  Example of complete forgiveness in the Bible- JOSEPH, Gen. 45:5-15; Gen 50:19-20, DAVID 1 Samuel 24:1-22, 2 Samuel 9:1-13. Stephen Acts. 7:59-60.  Father!!! Please have mercy on me for not forgiving others and give me the heart of flesh to forgive in Jesus name.  Father!!! By your grace, I forgive totally all that I have offended me; I released them from every captivity of bitterness in my heart.  Father!!! By your Holy Spirit, touch the heart of those that I have offended to forgive and forget my offenses in Jesus name.  Father!!! I release all that have offended me now, please release every benefit and blessing that un-forgiveness has delayed in my life, in Jesus name.  Fire of the Holy Ghost!! Purge my heart of every un-forgiveness in Jesus name.  Lord Jesus, by your blood, released me from every family captivity resulting from inherited offenses.  Father!!! Everyone I need to forgive for my life to break through, please lead me to them now in Jesus name.  Father!!! Let every seed of un-forgiveness in my life be consumed by fire in Jesus name.  Father!!! Please let me reap the reward of a forgiving heart in Jesus name.  Let us thank God for Late Pa. Josiah Akindayomi and other Men of honour inspired by the Holy Spirit to establish the RCCG.  Let us bless the name of the Lord for the obedience of Pastor E.A. Adeboye and other men of vision to the call of God upon them.  Let us thank God for not allowing hunger and famine in our country. Text: Rom. 5:15; Exo. 20, 34:5-7, Eze 18:19. Generational sins, courses and patterns are attitudes, actions, beliefs, behaviour, and/or habits that we have inherited from our family or relatives. We then “enter into” the same thing pattern and make it our own.  Father!!! Let every unknown soul tie influencing my life negatively, be consumed by fire in Jesus name.  Father!!! I stand in the finished work of the cross to severe my life from every effect of generational sin of my household in Jesus name.  Father!!! Deliver me from every evil pronouncement that is causing affliction in my family in Jesus name.  Father!!! By the fire of the Holy Ghost, every strongman perpetrating evil occurrence in my life and ministry let them be consumed by fire in Jesus name.  Father!!! I stand in the blood of Jesus and revoke every legal ground that the enemies have possessed in Jesus name.  Holy Ghost fire!!! Release your demolishing bullets and dynamites on every curse and soul ties affliction in my life.  Father; wherever your presence cannot be, restrain my feet from going there also.  Father; let me under the covering of your shadows.  Ask the Lord to send more (Labourers) missionaries to un-reached people groups. Matt 9:37-38, Mk.16:15.  Pray that the Church will have willingness and passion to commit more resources to missions, support and empowering of missionaries.  Pray for fresh empowerment to preach the good news, proclaim freedom to prisoners, recovery of sight to the blind and release of the oppressed. Is.61:1-3.  Pray for them anointing, compassion, revived prayer life, healthy family life, fruitfulness, grace and favour.  Pray for open heavens, God’s presence, courage, peace, joy, holy lifestyle, divine direction, mercy and long life for all our Missionaries.  Pray for signs and wonders, healings and deliverance to follow the ministry of missionaries on mission fields because unless people see the power, they will not believe.  Ask the Lord to send more (Labourers) missionaries to un-reached people groups. Matt 9:37- 38, Mk.16:15.  Pray there shall be harvest of miracles for you and all yours this year.  Pray that there shall be harvest of Miracles at every sphere of your lives this year.  Father!!! By the power in your word through daddy GO and in all ministrations let there be signs, wonders and harvest of souls.  Before this year runs out, let every barren come back rejoicing with singing1 Sam. 2:1 – 11 .  Father!!! Every power sabotaging my comprehensive miracles of victory, stumble, fall and die now!!!!!!  Let us come against every spirit of distractions that divert people attention away from the point of blessings.  Father; destroy every arrow of lameness fired against us at the beautiful gate of our destiny: In the name of Jesus.  Pray that every problem that are designed to crippled the destinies of any RCCG members will receive divine solutions in the name of Jesus.  Father; let there be healing miracles breaking forth in all our parishes as never before in the name of Jesus.  Destroy arrows of unbelief fired to hinder miracles in our life this year in the name of Jesus.  Miracles associated with the first month that is yet to happen in my life: hear the Word of the Lord: MANIFEST NOW BY FIRE!!! In the name of Jesus.  Father; destroy every evil arrow against genuine repentance among our members in the name of Jesus.  Father give us outstanding miracles that will magnetize multitudes into our churches this year in the name of Jesus.  I plead the blood, the blood of Jesus.  Thank God the author and finisher of your faith.  O! Lord my Father, let the four winds of the earth begin to blow in FAVOUR, of all the camp projects in Jesus name.  Father scatter every conspiracy of Hell against the completion of 3x3 Auditorium, in Jesus name.  Any strange Altar resisting the progress of this project, scatter by fire now in Jesus name. – Attract resources and finances in Jesus name. – Gain unusual speed in Jesus name. – Reject wrong workers in Jesus name. – Reject the voice of abandonment in Jesus name. – Receive grace and fresh anointing in Jesus name. – Be surrounded with the wall of fire in Jesus name. – Receive the light of God in Jesus name. Text Number 22:6; 23:1-2. An Altar is a place of sacrifice. It is a place where man makes contact with the spirit world either good or bad spirits. It is a place of covenant initiation, invocations and service. Covenant requires constant serving either by regular maintenance or activating of a dormant covenant. This knowledge is to awaken the sleeping Christians who desire to fulfil a glorious destiny to rise up and fight a good fight of faith in order to secure his/her destiny from the hands of the wicked and saboteurs.  I refused to be a prisoner of any local altar, in the name of Jesus.  I render every aggressive altar impotent, in the mighty name of Jesus.  I withdraw my name, blessing, breakthrough, prosperity and anything representing me from every evil altar, in the name of Jesus.  Father, please pray for Your son the General Overseer, increase his strength, anointing and wisdom in Jesus name.  Let us pray that God will fortify the strength of Daddy and Mummy G O. Isa. 41:13-14. Ask God to fortify Pastor E.A. Adeboye more with His ultimate Power.  Let us ask God to contend with those contending with Pastor E. A. Adeboye and his family lsa.49:24-26.  Let us pray for Daddy and Mummy G.O that God will help them to break more new grounds for RCCG worldwide.  Father, in the name of Jesus, send your reaper-angels into our harvest filed, mobilizing multitudes into this church for their salvation and deliverance all through this prophetic season – 13:39.  Pray for the global church to be bold as it speaks out for governments to respond.  Pray for governments across the world to take the urgent and ambitious action needed.  Father help that we might “Serve you with fear, and rejoice with trembling” (Psalm 2:11).  Father, enable me to have such a grand vision of You that I might fear You, that I might tremble in Your presence.  Father; help me not play around with sin, not just because of its consequences, but also because it grieves Your heart.  Almighty God, make me a new threshing instrument with many sharp teeth to tear apart every enemy of my life and your church.  Father!!! Please don’t let your glory depart from my life in Jesus name.  Let us thank God for the Men of honour inspire by the Holy Spirit to move Nigeria forward continually by praying Ps. 37:37, Ps. 125:1-3.  Let us plead for mercy on behalf of our nation for atrocities and wickedness committed in the land.  God will hear our prayer and recovered our nation from recession and all forms of famine.  God to put an end to terrorism, kidnapping, hired killing, corruption, militancy, communal clashes, Farmers and herdsmen clashes in the land.  Meditate on these scriptures and ask God to fulfil His promises 1.2Ki_19:34 For I will defend this city, to save it, for mine own sake, and for my servant David's sake. 2.Isa_38:6 And I will deliver thee and this city out of the hand of the king of Assyria: and I will defend this city.  Father save us from kidnappers, ritualists and cultists in Jesus' name.  Father expose all kingpins of cultism and kidnapping in Nigeria.  Lord set confusion in the camps of ritualists, kidnappers and cultists.  We decree and declare Nigeria free from kidnapping, rituals and cultism in Jesus' name. PRAYER FOR DIVINE REVELATION PRAYER FOR DIVINE REVELATION; Pro. 20:12; Isaiah 6:1-8, Ps. 51:15; II Kings 6:16-17.  My Father! My Father!! Cause me to hear new things that majority do not hear that will advertise destiny.  Poverty is a reproach, so therefore I say no to poverty in 2018.  2018 I have arrived therefore open up unto me/my family.  My father haven crushed poverty let me be receiving alerts throughout this year 2018.  We come against Cancer, High BP, Diabetes, hepatitis and other diseases in our nations this year in Jesus name.  Father; Let everyone afflicted by any of these diseases be healed in Jesus' name.  Let the blood of Jesus cleanse us from all sins and diseases.  We declare health, comfort and strength to every sick person in the hospitals and hones in Jesus' name!  Let every plague cease in every community, home and nation in Jesus' name!  We come against every form of accident in Nigeria and abroad be it air, road or rail etc.  Let every blood sucking demon on our highways be put to Shame this year 2018!  We declare the land, the air and waters safe for every journey in Jesus' name! (PERSONAL PRAYERS) PRAYERS FOR COMPREHENSIVE RESTORATION; Text Pro 15:21. Restoration can be immediate, gradual of progressive. It can be partial or total recovery. However, restitution is essential for total restoration.  Father!!! By fire by force, break into pieces every stubborn mountain in my life today.  Let us pray against fire accident in our homes, offices, markets and anywhere.  Let us ask God to be merciful concerning death and destruction of properties that can come from earthquakes in this year.  Let us pray against flood disaster and outrageous temperatures all over the world.  Let us ask God to console all those who are negatively affected through plane crash, earthquakes, hurricanes, tornadoes, flood, fire disaster, and the activities of gun men.  Let us give all the glory to God for the reality of the power of resurrection in RCCG mission. Matt. 28:1-4.  Let us thank God for using let’s Go A Fishing program to populate His kingdom. Acts. 2:37-47.  Pray for more strength for Daddy G O and all the Pastors, Ministers and workers, that God will use them mightily this 2018 “lets go a fishing”. Deut.33:25; Josh.14:11; 1Chron.29:12; Josh. 14:9.  Let us pray for divine visitation during all 2018 lets go a fishing all over the world. Ps.111:9; Ps.113:9-10; Gen.49:25.  Ask that God would show all those who have been mocking you saying, where is your God, that He is by your side.  By faith, lift up your hands and begin to thank God for revival of your prayer life and your testimonies. Appreciate God for answers granted to your all our prayers in this first lap. Pray all manners of prayers of thanksgiving and praises cement all He has done AND WHAT HE WILL DO for you. Thank God for giving you comprehensive victory already. BLESS HIS HOLY NAME to empower you to join the train for the next round of fasting and prayer. In Jesus Mighty Name we have prayed. ……………Amen.